An interesting mix of components, but ultimately the AMD 10 CPU doesn't quite deliver. Is there such thing as enough CPU power? 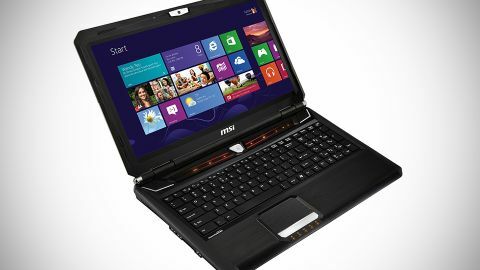 MSI seems to think so with the release of the MSI GX60 gaming notebook. That's because, intriguingly, the MSI GX60 pairs one of AMD's A10 fusion CPUs with the AMD Radeon HD 7970M graphics chip. So that's a budget-orientated processor combined with the fastest GPU AMD currently offers. Bold move, MSI. For gaming, of course, graphics grunt has always been critical. Indeed, Intel has been winding back on CPU performance in recent years as it attempts to step up the performance of its graphics cores. But MSI really is pushing that notion og good-enough CPU performance to its absolute limits. Whether it works will depend on the ability of that A10 processor to maintain playable frame rates at all times. If you're wondering what the upsides might be, well, it comes down to two things. The A10 processor is cheaper than a high end mobile CPU. And it's also more power efficient. That's true because the CPU part of the AMD A10 package is pretty modest. It also sports an integrated graphics core that can be used when the system is running on battery power. But then, all of Intel's mobile processors also sport what you might call back-up integrated graphics, too. Even so, you'd hope that the MSI GX60 was both longer lasting and cheaper than the gaming laptop competition. If it delivers on those two metrics and keeps the frame rates trucking, MSI could be onto a winner. The price comparison is easy enough to make. The PC Specialist Vortex III 680, for instance, packs the alternative flagship GPU from the green team, NVIDIA's GeForce GTX 680M along with a pricey Intel Core i7. And it's nearly £150 more expensive. Then there's Samsung Series 7 Gamer, powered by Intel Core i7 and NVIDIA GeForce GTX 675M but yours for £1,349. That's an extra £300, therefore. Toshiba's Qosmio X870 and its Intel Core i7 and NVIDIA GeForce GTX 670M combo is even pricier at around £1,700. Admittedly, there are several other variables that effect pricing, including screen size, storage specification and more. But one thing is clear enough. If the MSI GX60 delivers great gaming performance, it'll be a bit of a bargain.